Remove heat from the water discharged from the condenser so that the water can be discharged to the river or recirculated and reused. A cooling tower extracts heat from water by evaporation. In an evaporative cooling tower, a small portion of the water being cooled is allowed to evaporate into a moving air stream to provide significant cooling to the rest of that water stream.Cooling Towers are commonly used to provide lower than ambient water temperature and are more cost effective and energy efficient than most other alternatives. The smallest cooling towers are structured for only a few litres of water per minute while the largest cooling towers may handle upwards of thousands of liters per minute. The pipes are obviously much larger to accommodate this much water in the larger towers and can range up to 12 inches in diameter. When water is reused in the process, it is pumped to the top of the cooling tower and will then flow down through plastic or wood shells, much like a honeycomb found in a bee‟s nest. The water will emit heat as it is downward flowing which mixes with the above airflow, which in turn cools the water. Part of this water will also evaporate, causing it to lose even more heat. One way to distinguish between cooling towers is how the air and water interact, open cooling towers or closed cooling towers. Open cooling towers, also called direct cooling towers, allow the water to come into contact with outside air. If cooled water is returned from the cooling tower to be used again, some water must be added to replace the water that has been lost. Pollutants are able to enter into the water used in these processes and must be filtered out. Another method of combating the excess minerals and pollutants is some means of a dissolved solid control, such as a blow down. With this, a small percentage of the flow is drained off to aid in the removal of these contaminants. 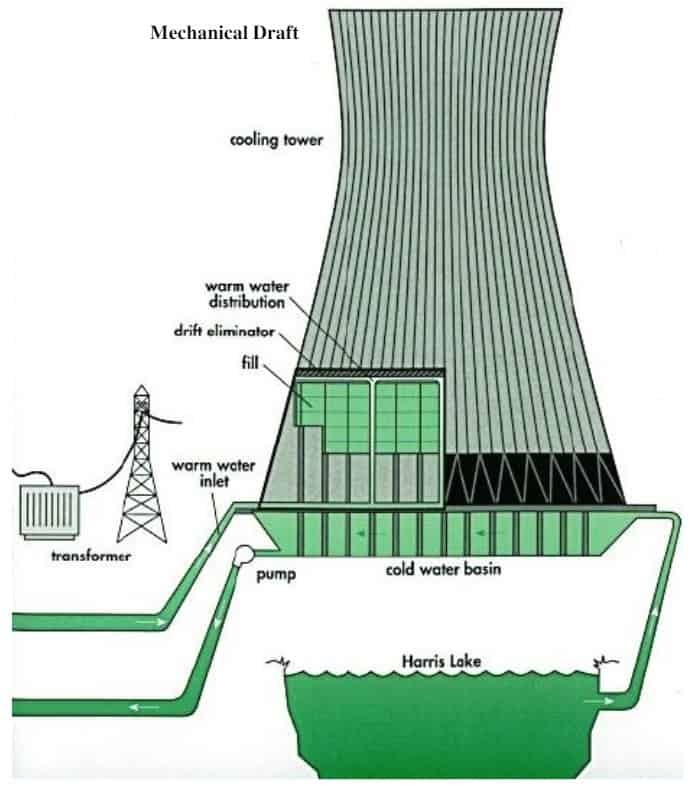 This is fairly effective, but not as efficient as filtration.Closed loop (or closed circuit) cooling tower systems, also called indirect cooling tower systems, do not allow the water to come into contact with any outside substance,therefore keeping the water more pure due to the lack of foreign particles introduced.Another classification of cooling towers is made between field assembled towers and factory assembled towers. Field assembled towers are shipped in pieces and assembled on site by a highly qualified and certified installation team. Factory assembled towers typically only require the fan motor to be mounted. Natural draft towers are typically about 120 m high, depending on the differential pressure between the cold outside air and the hot humid air on the inside of the tower as the driving force. No fans are used.Whether the natural or mechanical draft towers are used depends on climatic and operating requirement conditions.The green flow paths show how the warm water leaves the plant proper, is pumped to the natural draft cooling tower and is distributed. The cooled water, including makeup from the lake to account for evaporation losses to the atmosphere, is returned to the condenser. Mechanical draft towers uses fans (one or more) to move large quantities of air through the tower. The air flow in either class may be cross flow or counter flow with respect to the falling water. Cross flow indicates that the airflow is horizontal in the filled portion of the tower while counter flow means the air flow is in the opposite direction of the falling water.The counter flow tower occupies less floor space than a cross flow tower but is taller for a given capacity. The principle advantages of the cross flow tower are the low pressure drop in relation to its capacity and lower fan power requirement leading to lower energy costs.All mechanical towers must be located so that the discharge air diffuses freely without re circulation through the tower, and so that air intakes are not restricted.Cooling towers should be located as near as possible to the refrigeration systems they serve, but should never be located below them so as to allow the condenser water to drain out of the system through the tower basin when the system is shutdown. The forced draft tower, has the fan, basin, and piping located within the tower structure. In this model, the fan is located at the base. There are no louvered exterior walls. Instead, the structural steel or wood framing is covered with paneling made of aluminum, galvanized steel, or asbestos cement boards. During operation, the fan forces air at a low velocity horizontally through the packing and then vertically against the downward flow of the water that occurs on either side of the fan. The drift eliminators located at the top of the tower remove water untrained in the air. Vibration and noise are minimal since the rotating equipment is built on a solid foundation. The fans handle mostly dry air, greatly reducing erosion and water condensation-problems. The induced draft tower show in the following picture has one or more fans,located at the top of the tower, that draw air upwards against the downward flow of water passing around the wooden decking or packing. Since the airflow is counter to the water flow, the coolest water at the bottom is in contact with the driest air while the warmest water at the top is in contact with the moist air, resulting in increased heat transfer efficiency. They are equipped with mechanical draft fans to augment airflow. Consequently,they are also referred to as fan-assisted natural draft towers. The intent of their design is to minimize the power required for the air movement, but to do so with the least possible stack cost impact. Properly designed fans may need to be operated only during periods of high ambient and peak loads.